Like all insects with complete metamorphosis, a butterfly's life goes through four distinct stages. It begins as an egg, which hatches into a larva (a caterpillar). After some time, the larva turns into a chrysalis. While it is in the chrysalis stage, it becomes a butterfly. The butterfly then hatches out and lays more eggs. The main predators of butterflies are birds, just as the main predators of the crepuscular moths are bats. Also monkeys and tree-dwelling reptiles are predators, and some insects and spiders. Certainly all reptiles and monkeys have good colour vision, so that butterfly coloration works just as well on them as it does on birds. The details vary from group to group, and from species to species. The caterpillars also have colours with similar functions. The poisonous substances which make some butterflies noxious to eat are got from the plants eaten by their caterpillars. ↑ Hall J.P.W; Robbins R.K. & Harvey D.J. (2004). "Extinction and biogeography in the Caribbean: new evidence from a fossil riodinid butterfly in Dominican amber". Proceedings of the Royal Society of London B 271: 797–801. doi:10.1098/rspb.2004.2691. 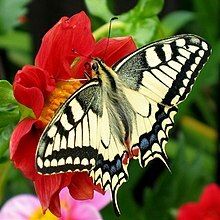 Wikimedia Commons has media related to Butterfly. This page was last changed on 14 March 2019, at 12:34.